These acrylic keyholders will be available at the upcoming Animate Girls Festival, to be held November 10-11, 2018 at Ikebukuro’s Sunshine City. 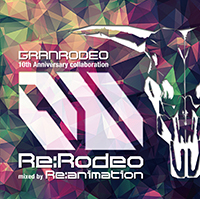 「Re:Rodeo」, the Granrodeo remix CD sold at G10 will be available at this weekend’s Animate Girls Festival too. AGF takes place this weekend, 11/7-11/8, from 9:00~16:00 (last entry 15:30) each day at Ikebukuro’s Sunshine City. The CD will be on sale in the Bandai Visual-Lantis booth, located in the Yellow area (Cultural building), 2nd floor, Y-3. It retails for 2000 yen, tax included.